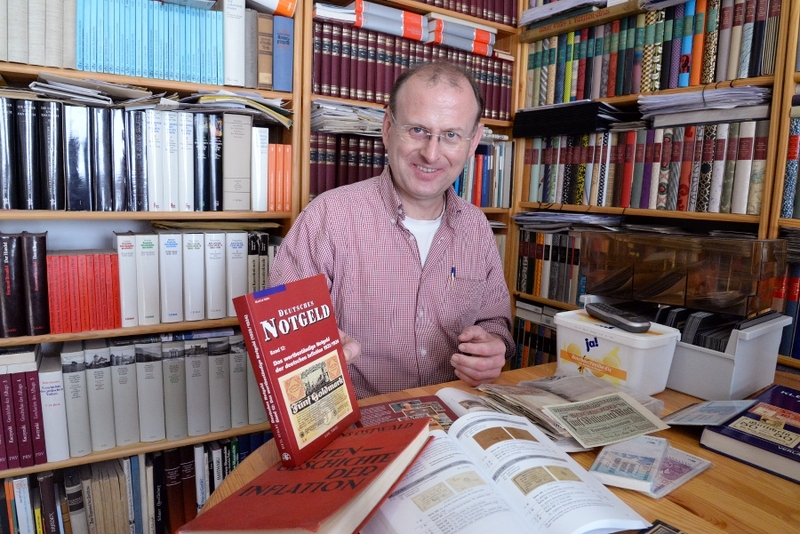 We recently spent some time with the economic historian and bank bill broker, Winfried Bogon, whom we had contacted to purchase notgeld or emergency money that was used in times of fiscal crisis such as hyperinflation. A well known episode of hyperinflation occurred in Germany in the 1920s. When World War I began in 1914, Germany ceased to back its currency with gold reserves. As the conflict was expected to be short, the Empire funded its efforts by borrowing, rather than with savings or taxation, leading to a steady devaluing of the Deutschmark as the war drew out over four years. The end of the war saw the demise of the German Empire, which was succeeded by the Weimar Republic in 1919 that became responsible for paying the massive reparations demanded by the Allies under the Treaty of Versailles (1919). This debt was to be paid in gold-backed hard currency, not the rapidly depreciating ‘paper Marks’, as well as in commodities such as coal, iron, steel and wood. By mid-1923 workers were being paid as often as three times a day. Their wives would meet them, take the money and rush to the shops to exchange it for goods. However, by this time, more and more often, shops were empty. Storekeepers could not obtain goods or could not do business fast enough to protect their cash receipts. Farmers refused to bring produce into the city in return for worthless paper. Food riots broke out. Parties of workers marched into the countryside to dig up vegetables and to loot the farms. Businesses started to close down and unemployment suddenly soared. The economy was collapsing. 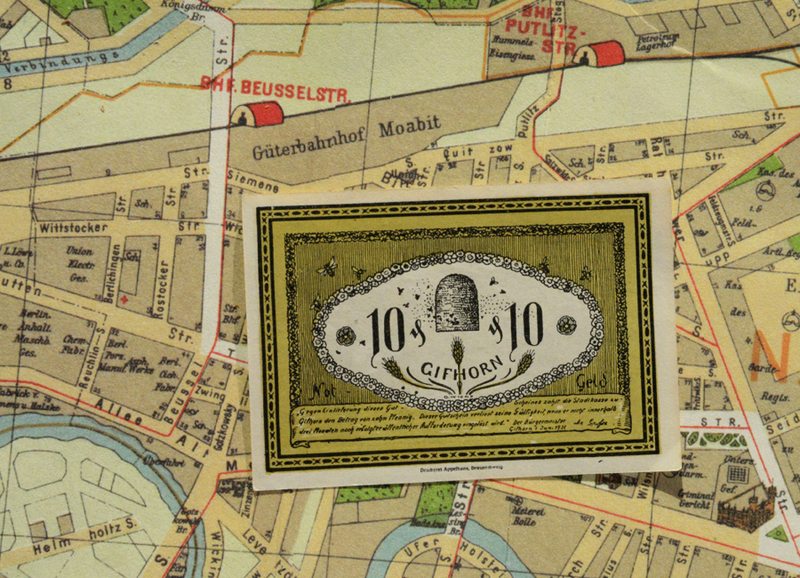 Notgeld were issued during this period by townships, industries and utilities. Forms of emergency and community currency came into use across many parts of Europe and are still used today in some places. Valid for short periods of time, Notgeld were to be spent not saved, nevertheless according to Winfried, German Notgeld and a subset of bills known as Seriensheine were unique as they were often designed to be collectable. Featuring commissioned illustrations, etchings and employing sophisticated printing techniques, these bills present an ephemeral pictorial history of financial crisis. revealing the desires and opinions of communities during these times of distress. Amongst Winfired’s collection were notes or coupons issued by merchants valid for basic supplies such as flour or sugar, prompting the money expert to recall times when pieces of coal were more valuable than coin as they had a greater use value. 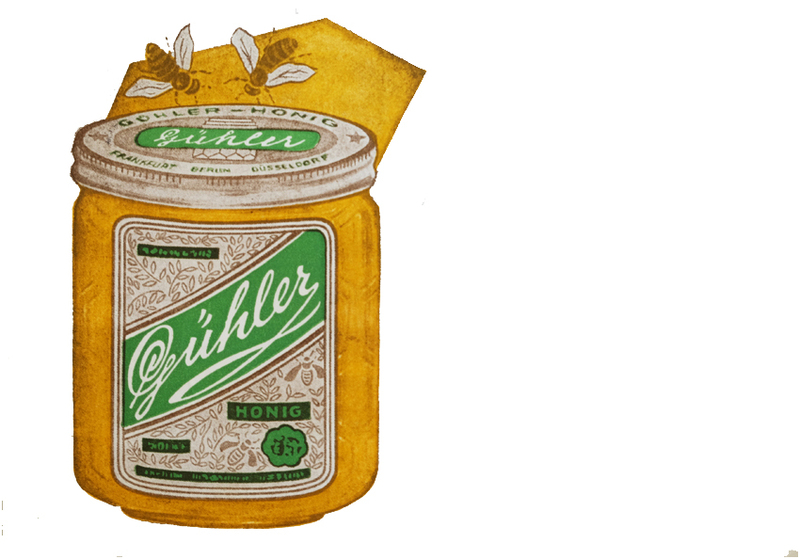 We had already heard from several beekeepers that in the DDR the state bought home-produced honey from citizens for a fixed price, suggesting that the local tradition of keeping bees was at one time an important alternative source of income. Such accounts piqued our interest to use honey in lieu of money. The American money manager George J. W. Goodman, writing under the moniker Adam Smith, commented that when one US dollar became equivalent to one trillion Marks in 1923, the German currency stopped making sense. For some people, having to calculate such fantastic figures for everyday exchanges brought on a nervous affliction known as ‘Zero Stroke’, a condition which compelled sufferers to write endless rows of zeros or ciphers. Eventually a simple cure for these hyperinflationary maladies was found in 1923, when the Reichsbank issued a new note to replace the Mark. One Rentenmark was exchanged for one billion of the old currency, striking nine zeros from the latter and prompting the ‘miracle of the Rentenmark’. As the Republic was still rich with working mines, farms, factories and forests, the new currency was backed by property mortgages and factory bonds that effectively speculated on the future productivity of the state—a form of wishful thinking known as credit. Goodman notes that the word ‘credit’ derives from the Latin credere, ‘to believe’, to proffer that the German people must have desperately wanted to believe. Winfried concurred, and it seems we all agree; ‘money is a matter of belief’ that is fundamentally a system of trust. Kosares, Michael J., 1970. ‘The Nightmare German Inflation.’ Scientific Market Analysis. Smith, Adam, (Goodman, George J.W. ), 1981.‘The German Inflation, 1923.’ In: Paper Money, pp. 57-62. You are cordially invited to the Unofficial Opening of the Plan Bienen Mint. 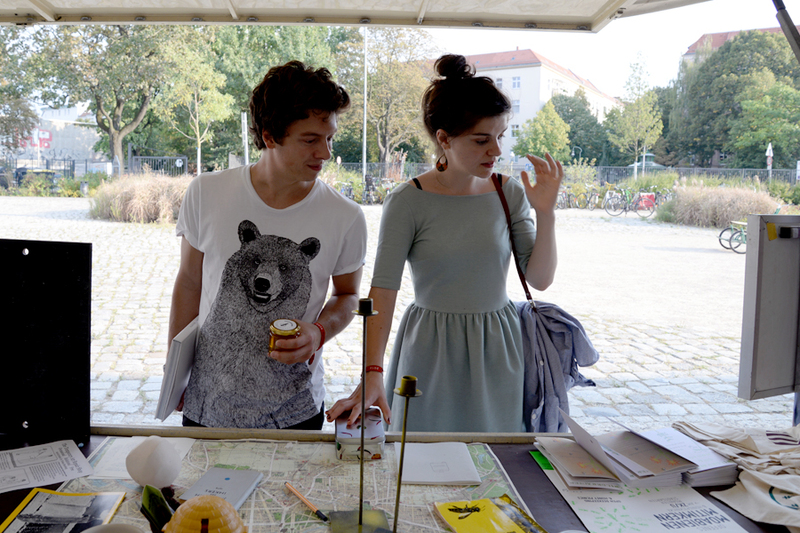 After 3 months researching real and possible relationships between people, bees, honey and time in Berlin, our time is (almost) up. We have over the summer accumulated quite a number of very local honeys, and we would rather share them with you than try our luck with Australian customs. 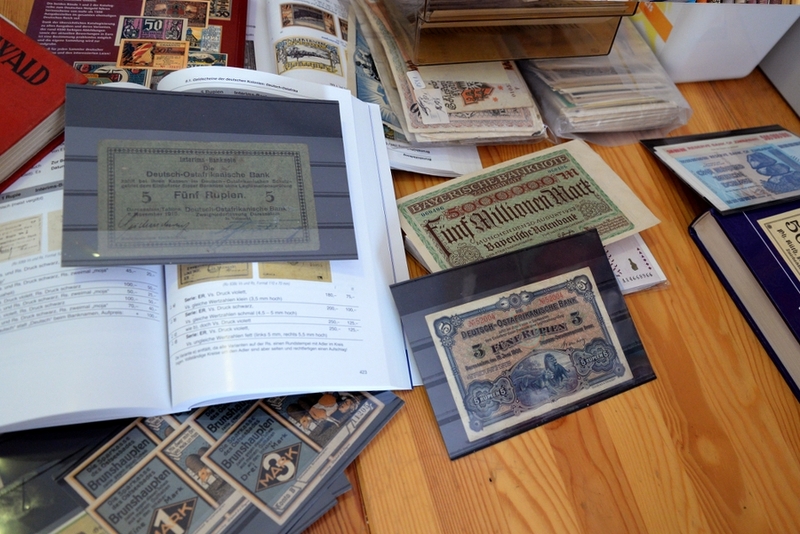 See what trades have been taking place between beekeepers and honey-eaters, with a special private viewing of the commemorative Notgeld soon to be minted for each exchange. 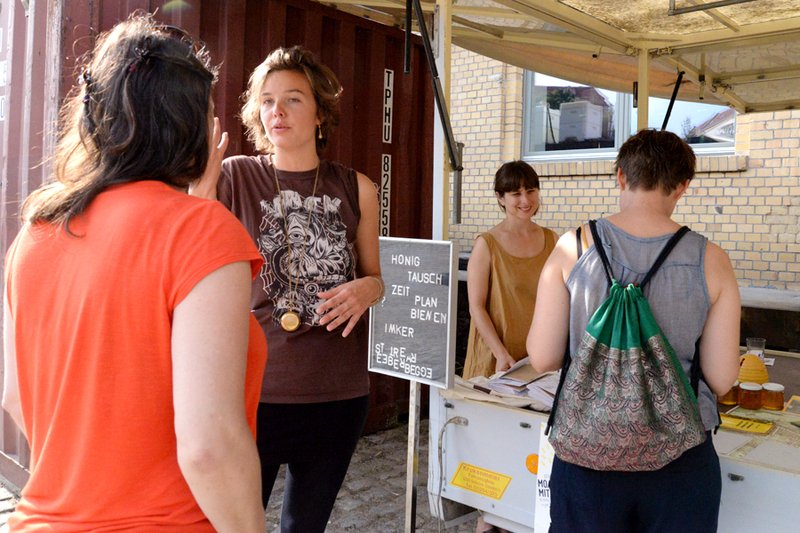 For anyone in Berlin this weekend, tomorrow at ZK/U is the very first ‘Gütermarkt‘ – a different kind of local market. 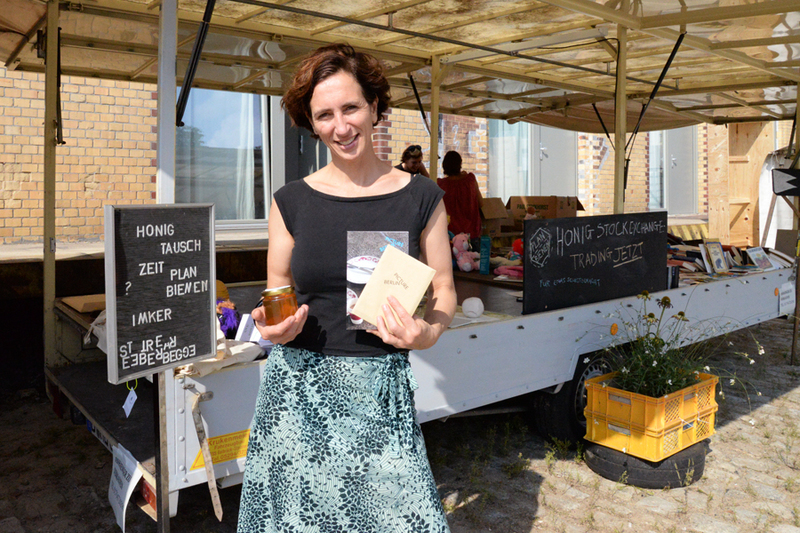 We will be there all day with the Plan Bienen – ‘Honey Stock Exchange’. Bring something special, home-made or home-grown for your chance to take home honey produced by the bees right here at ZK/U. High-frequency trades welcome, all reasonable offers considered. ‘Killer Bee’ movies emerged as a popular strain of ‘creature feature’ films in the Cold War era of the 1960s. Films such as The Deadly Bees (1966), Genocide (1968) and The Swarm (1978) established a genre based around formulaic ‘nature’s revenge’ plot lines in which insects, often mutated in scientific experiments, escape from laboratories to attack and kill human protagonists. In The Bees (1978) swarms of mutant bees bring down military aircraft, target politicians and deliver an ecologically-driven ultimatum to the United Nations via a human interpreter. Such fantastic narratives can be read as popular cautionary tales about the modern sciences empowering humans to ‘play god’, underpinned by a Cold War fear of biological warfare and the scientific supremacy of ideological rivals. Curiously these films attribute direct agency and political action to swarms of angry, organised non-human actors, entertaining the prospect of non-human rights. The phenomenon of disappearing bees synonymous with Colony Collapse Disorder has compelled lobby groups such as Mellifera e.V. in Germany to interfere on behalf of this ‘subaltern species’ in human affairs, resulting in a temporary ban on the use of neonicotinoid insecticides in the EU, which is soon take effect in the US as well. 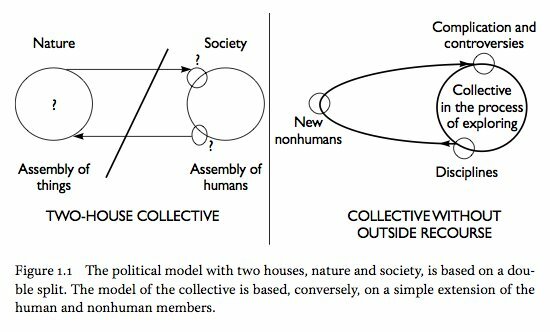 In his book The Politics of Nature (2004), Bruno Latour details his vision for a collective yet-to-come of human and non-human agents that would supersede the society/nature divide upon which modern institutions are founded. Might this most recent phase of human-bee relations provide an entry point to consider how such ‘multinatural’ political associations are actually taking shape? Furthermore, is it only in fiction that a species capable of collective decision-making and with which human cultures share a long history–and also food–could have ‘thought’ to take actions in order to change our behaviour? Tomorrow is Open Haus again at ZKU, from 18:30. 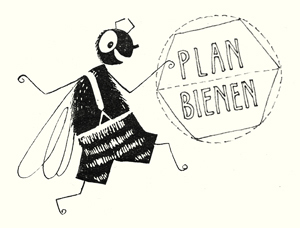 Plan Bienen will be participating by offering a behind-the-scenes sunset soirée with beesting cocktails and irregular currencies. Bring something to exchange (conversations accepted). To call ourselves geological agents is to attribute to us a force on the same scale as that released at other times when there has been a mass extinction of species. Dipesh Chakrabarty, The Climate of History: Four Theses, 2009. Dipesh Chakrabarty begins his essay The Climate of History: Four Theses (2009) by asking his readers to imagine ‘a future without us’, raising the prospect of human finitude as a potential (and some would say inevitable) catastrophe that appeals to a notion of human universals. The historian argues that scientific consensus regarding human induced climate change has facilitated a significant shift in our systems of knowledge. Humans who have evolved to cause significant changes in the Earth’s atmosphere, environment and ecological systems have become geological actors over recent periods of expansion and industrialisation, as put forward in the Anthropocene thesis. In doing so humans have instigated a series of ecological reactions that may potentially render the planet inhospitable for their continued advancement (and thereby suggesting the limits of capitalism). Chakrabarty lists recent droughts, cyclones, brush fires, crop failures, melting glaciers and polar ice caps, the increasing acidity of seas and damage to the food chain as some of the consequences of recent human activities and innovations. In light of such developments, Chakrabarty urges his readers to reconsider the discipline of human history, which over the course of its development occurred apart from natural history, to recognise human agency in changing the most basic physical properties of its host planet. 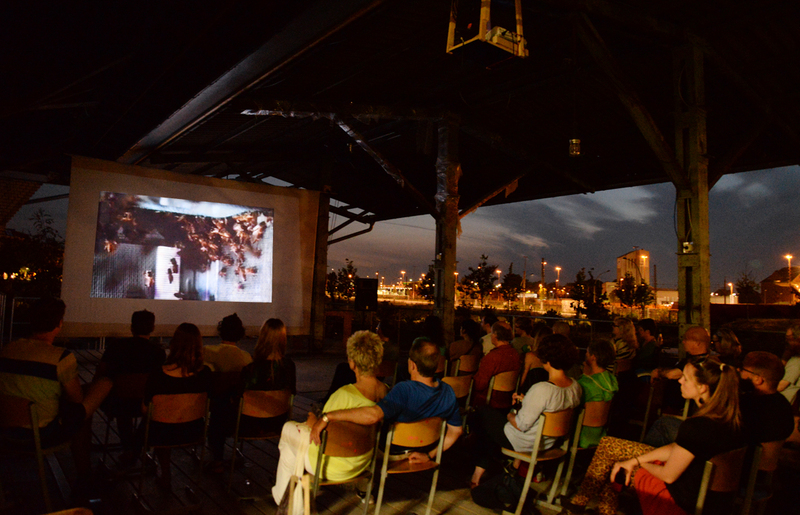 At a public lecture delivered at Haus der Kulturen der Welt Berlin, June 2014, the influential scholar pressed for another kind of historical thinking in which nature might act as a co-author. Paintings of beehives in the tomb of Pabasa, Valley of the Queens. In her contribution to the Reaktion Books animal series, Bee (2006), Claire Preston refers to pictorial records depicting the cultivation of bees to claim that apiculture originated with the ancient Egyptians as early as 2500 BC. She continues to discuss other pre-common era records of bee cultivation and honey hunting across Europe and India, describing a significant and even symbiotic co-existence between humans and bees through the ages. Indeed bees and other pollinator species are essential to the human food chain. More than one-third of the world’s crop species, such as alfalfa, sunflower and numerous fruits and vegetables, depend on bee pollination. Furthermore, scientists estimate that animal mediated pollination is required for the reproduction of nearly 70% of the world’s flowering plants, including between 60% and 90% of wild plants. In recent years the mass disappearance and death of worker bees from managed hives, a syndrome known as Colony Collapse Disorder (CCD), has raised awareness of the roles and challenges faced by bee populations in the industrialised world. Scientists have not been able to narrow down a single cause of CCD, rather attributing the sudden death of bee populations to multiple and interactive conditions. These include the prolonged use of insecticides and in particular neonicotinoids; new parasites and pathogens such as Varroa mite and Nosema; environmental stresses including a lack of biodiversity in monocultural farming environments; and effects of climate change such as season creep. 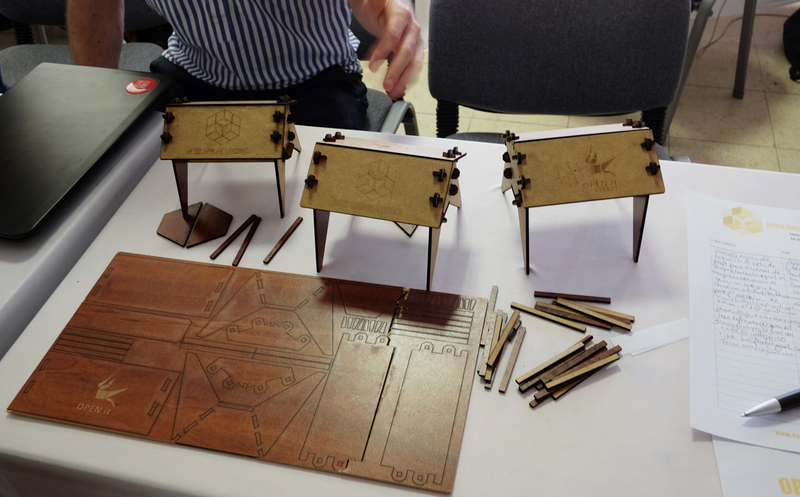 The phenomena of CCD and the lack of accurate data about global bee populations and other pollinator species may have inspired a renewed interest in urban beekeeping and community innovations such as Open Source Beehives. Bee lobby groups, such as Mellifera e.V. in Germany, that ‘interfere’ politically on behalf of bees, have been successful in having a temporary ban placed on the use of neonicotinoids in the EU, although not yet in the US where CCD has had a greater impact. If we posit bee colony mortality against the expansion of human populations and their geological effects, does the prospect of the extinction of the former species necessarily spell catastrophe for the latter? The artist Ally Bisshop suggests that precarious bee populations are allegorical of human finitude as both species are effectively subservient to the sun. If pitched as a contest between populations of human, bee and other heliocentric species with regards to their ability to inhabit, extract resources and manipulate their environment, Chakrabarty reminds us that the eventual decline of the human species that can be glimpsed in the death of bee populations is not ‘a crisis for the inorganic planet’ and would not spell disaster for the Earth and its most prolific matter. What are the implications of Chakrabarty’s call for another mode of history, in which nature might be a co-author, for our own practice that concerns social relations and exchange? How are such interspecies relations translated as politics and what is the potential for non-human agency in the expanded notion of culture that Chakrabarty suggests? Bisshop, Ally, 2014. ‘The Bees Will Tell Us’ (draft copy). Also available in Bisshop, Ally and Messih, Gemma, 2014. Eventually the Sun will Consume the Earth. Chakrabarty, Dipesh, 2009. ‘The Climate of History: Four Theses.’ Critical Inquiry, no. 35 vol. 2, pp.197–222. Greenpeace Research Laboratories, 2013. Bees in Decline: A review of factors that put pollinators and agriculture in Europe at risk. Greenpeace International, April 2013. Mellifera e.V., 2014. 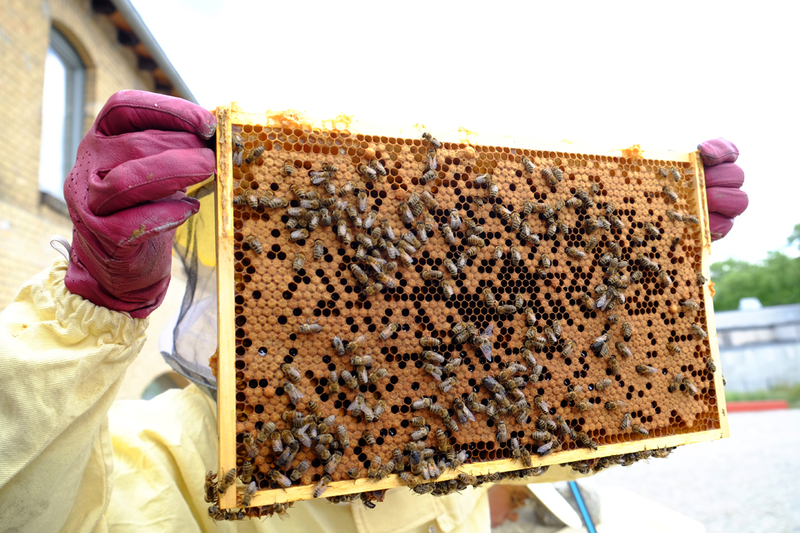 ‘Neonicotinoids – Beekeepers interfering on behalf of the Bees.’ Mellifera e.V. News, 13 March. Preston, Claire, 2006. Bee. Reaktion Books, London 2006. Spivak, Marla; Mader, Eric; Vaughan, Mace and Euliss, Ned H., 2011. ‘The Plight of the Bees.’ Environmental Science & Technology, no. 45, pp 34–38. 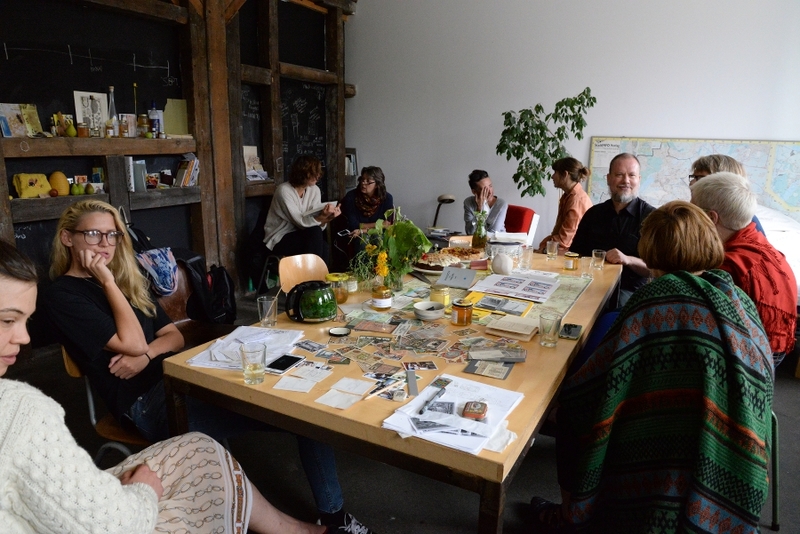 The artists invite you to be part of an experimental exchange network in which self-produced honey is traded for various non-monetary things (time, skills, help etc.). Open to beekeepers and honey-eaters alike. No obligations! You can also join by loaning a domestic object related to bees or honey – this could be anything…. 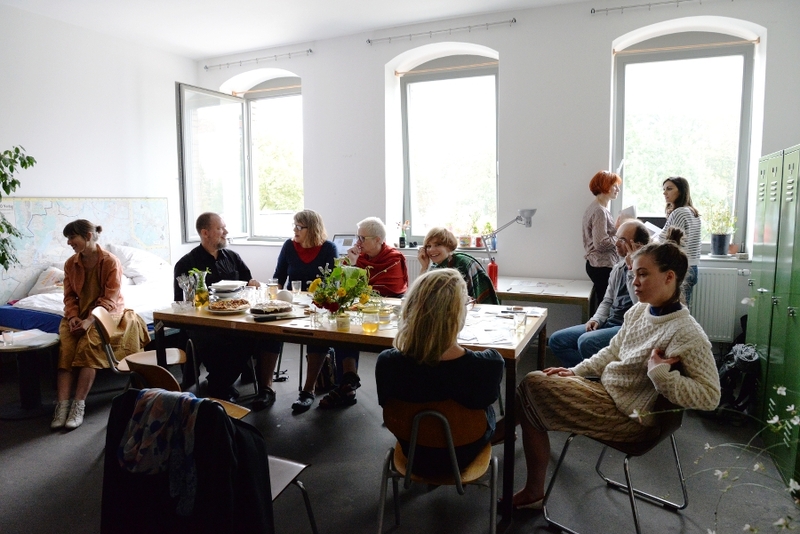 All borrowed items will be displayed together in a window installation in Moabit, after which they will be returned to their homes. 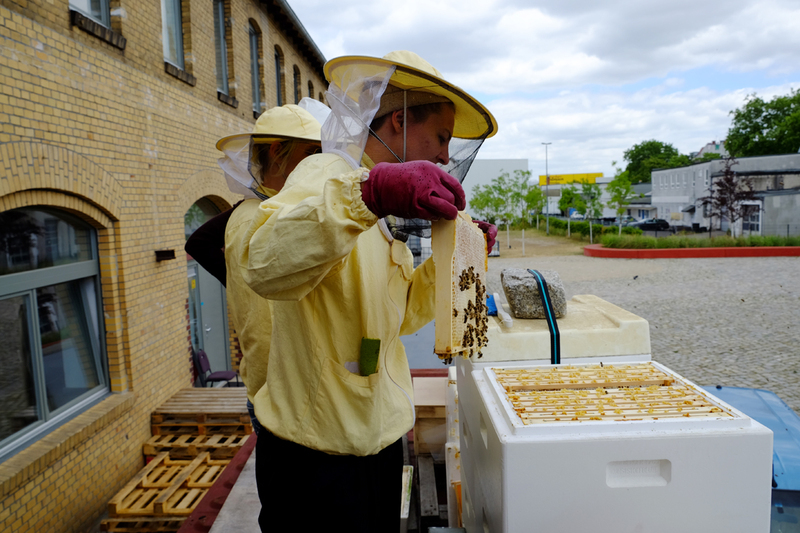 Here at ZK/U we have our own little colony of bees to observe, maintained by the Moabienen Mitimkern, a team of busy young beekeepers who are bringing a number of beehives and bee-related activities to the neighbourhood of Moabit, one of Berlin’s oldest and sleepier parts. There are four hives perched on top of a container out the front, including the especially calm ‘Vanilla Ice’, and ‘Rosalee’, a consolatory gift from another beekeeper who stole one of the Moabienen’s colonies whilst it was swarming (an antiquated German law entitling whoever captures a swarm to keep it..). Yesterday we joined Elisa and Katja as they checked up on the hives and prepared a new colony for Jana, who will install them in her local Friedhof. Though the decidedly unsummery weather meant we couldn’t harvest any honey, the bees seemed happy enough. 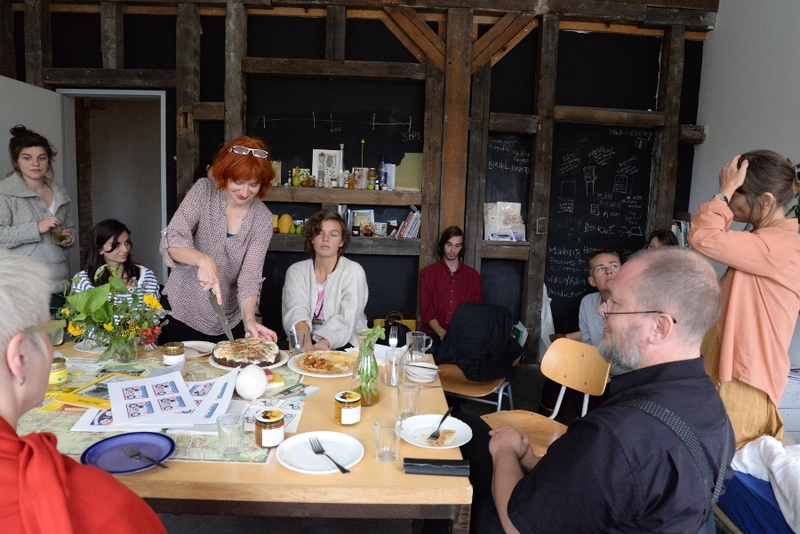 During the week we met Anna, a beekeeper at Prinzessinnengarten, who wondered what it would be like to be a bee for a day. Karl von Frisch discovered that bees possess a ‘language’ through a series of experiments he began in the 1920s. Now scientists following in his wake are attempting to communicate with bees using robots that will ‘live’ amongst bees and with a view to influence their decision making processes and behaviour. Such propositions bring to my mind China Miéville’s science fiction Embassytown, in which humans co-habiting a planet with large insectoid hosts shift the parameters of language across both species—the story’s protagonist is a simile that functions as part of an alien language without the faculty to lie. The RoboBee Project headed by Raul Rojas at the Freie University Berlin have developed a honeybee robot that can do a basic waggle dance. As can be seen in the segment below, these dancing bots could potentially be used to tell real bees to fly to specific locations. Project ASSIS|bf coordinated by Dr. Thomas Schmickl of the Artificial Life Lab at the University of Graz are developing robots that will be able to communicate, adapt and evolve to ‘live’ amongst populations of bees and fish. By focusing on ‘swarm intelligence’ the project proposes to pioneer methods by which humans can interfere in animal societies in order to manage the environment. Schmickl lists various benefits of doing so, ranging from pest control to agriculture, but also considers contemporary human, social media affected society to be a social cyborg in itself. Thus, he reasons, model systems in the lab for studying mixed-societies of robots, algorithms and social organisms are crucial to understanding our own human society. Illustrator, author and beekeeper, M.E.A. McNeil’s summary of the book can be read here and here. Tom Seeley’s 2011 lecture at Cornell University is below. Last week we attended part of the 5th OuiShare Summit in Berlin, a congregation of collaborative economies enthusiasts and advocates. Amongst those presenting their own (very real) approaches to a post-monetary world in this most resourceful and ‘creative’ of European cities, we found Velogistics – a cargo bike share system or postfossilmobil where you can borrow a pedal-powered transportation vehicle from someone in your neighbourhood; Leila – a free shop and borrowing-centre for all sorts of useful objects here in Berlin; Lebensmittel Retten – a food waste rescue & distribution operation; and curiously, an open source beehive project.. Open Source Beehives – a collaborative initiative setting up standardised plywood beehives across different parts of the world, equipped with data sensors to monitor the health and behaviour of the bees they house, with a view towards helping scientists studying the various threats faced by today’s bee populations.